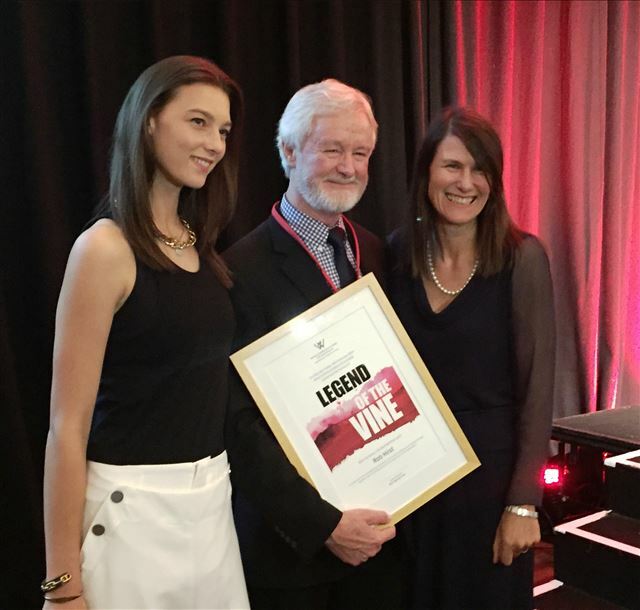 Wine Communicators of Australia (WCA) has announced the 2015 NSW ‘Legend of the Vine Award’ recipient as Australian wine champion Rob Hirst, Chairman of Fine Wine Partners. Rob received the award in front of an audience of 350 wine industry peers at the WCA Sydney Royal Wine Show Trophy Winners Lunch on Friday, February 13. The ‘WCA Legend of the Vine Award’ recognises a member of the wine industry who has made an outstanding and lasting contribution to the wine business and industry at large, as well as displaying a strong affinity for the objectives of WCA. WCA Chair Angus Barnes said this Award was created to acknowledge individuals who represented the Australian wine industry with passion, drive and leadership, particularly in communication. Announcing the award at the Sydney lunch, Mr Barnes said there were few in the wine industry who don’t know Rob – “for many years now he has been a remarkable, tireless and genuine campaigner for Australian wine at home and overseas, particularly during the past five years in China”. “Rob’s understanding of, and contribution to, fine wine has spanned several decades, representing many of the world’s truly great brands during his tenure at the helm of Tucker Seabrook and continues today as Chairman of Fine Wine Partners,” he said. “He is a staunch believer in wine education and training, and his facilitation of both the Court of Master Sommeliers since 2008 and the Wine and Spirits Education Trust (WSET) since 2009 has given thousands of Australia professionals the opportunity to elevate their qualifications in Australia, including two Master Sommeliers working in our industry. Rob, a Chartered Accountant and MBA (Marketing-Macquarie) started in the liquor industry 30 years ago after eight years with PWC, two years as a Troop Commander in the Australian Army during the Vietnam Conflict and two years with Rothmans Group in Melbourne. In 1985 he took over Tucker Seabrook which became a national organisation specialising in premium wines, spirits, liqueurs and beers. Then in 2005, Tucker Seabrook merged with the Lion Nathan Wine Group to form Fine Wine Partners, where Rob was appointed to his current position of chairman. In 2006, Rob, with late wife, Judy, was inducted into the Restaurant and Catering Australia Hall of Fame for services to industry – and his commitment continues through initiatives such as ‘Australia’s Wine List of the Year Award’, which he started more than 20 years ago. As a 2015 NSW Legend of the Vine recipient, Rob receives life-time membership to WCA, joining a highly-respected list of names including Colin Campbell, Patrick Iland, David Lowe, Phil Laffer, James Halliday, Huon Hooke, Chris Anstee and Lyndey Milan.